The Minnesota Timberwolves almost didn’t have enough players to put on the court after Ricky Rubio was listed as out with a sore ankle. So what did the NBA team do? They started searching for anyone who had decent basketball skills, jump in a car and get to the arena before their game with the New York Knicks Thursday night. 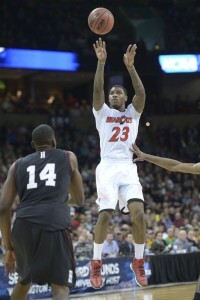 That lucky player got to be Sean Kilpatrick, who signed a 10-day contract with the team. Kipatrick, who was a standout scorer with the Cincinnati Bearcats last year, was finishing practice with his NBA D-League team when he got the call. Without any hesistation, Kilpatrick jumped into his car and drove two hours from Delaware and arrived at Madison Square Garden with about 45 minutes left before tip-off. Imagine getting a call from an NBA team and saying that they needed you asap or else they had to forfeit the game. I’m gonna go pull out my Grant Hill Filas and have them ready in case the Lakers call. Gotta be prepared for ANYTHING.